Every carmaker on the planet, large and small, in addition to Wall Street, Silicon Valley and governments, seem united in the conviction that we are all going to abandon the wheel and be driven around by robots. The trouble is that, apart from a few daredevils abusing (and sometimes crashing) Teslas, there has been little indication to date that a significant number of the world's drivers want such cars. What's happening: According to a new Axios/SurveyMonkey poll, a lot of Americans are fearful of autonomous cars, but 33% of them are at least somewhat likely to buy one once they are available. That was the case in all age categories through 54. Why it matters: To the degree the survey is accurate and reflects a broad global trend, everything from the world's sprawling car industry to roads and cities themselves could be on the cusp of a fundamental transformation. While a solid minority said they might buy one, the majority said they are scared of autonomous cars. 68% are fearful as pedestrians, walking around amid self-driving cars. 64% said they are fearful as a passenger. Only 10% said they would feel extremely or very safe as a passenger or pedestrian. Go deeper: Stanford University professor Jerry Kaplan writes in the WSJ that the problem is not that people reject risk — they know driving is dangerous. It's that they reject risks that seem bizarre: They do not accept machines making mistakes that a human wouldn't; after all, the machines are supposed to be better. That's ostensibly why we are turning to autonomous cars. It uses no cobalt, an expensive metal contained in almost all commercial lithium-ion batteries. In recent months, China has all-but cornered the market for cobalt, and the price has sky-rocketed. A record-high measure: A metric known as the "relative dielectric constant," which measures how much energy can be stored in an electric field," may be higher than ever recorded in a material. Braga did not respond to another followup email yesterday about whether the battery holds a charge when unplugged. Artificial intelligence researchers, notching little recent progress toward the creation of a machine that thinks like a human, have largely halted such work in favor of applying what's been discovered so far, says a leading AI expert. What's going on: Andrew Moore, dean of computer science at elite Carnegie-Mellon University, tells Axios that while current AI displays impressive capability in visualization, speech, and difficult games, it "still contains no magic." "We have pretty much stopped trying to mirror human thinking out of the box," he said. "We are focusing on engineering" what has already been invented. Why it matters: Moore's remarks align with a growing chorus of doubt in the AI community that current methods can attain what the field calls "artificial general intelligence." In September, for instance, Geoff Hinton, one of the field's most-respected pioneers, said researchers needed to start over. Moore says that does not mean he is a pessimist: Even if AI researchers make no further breakthroughs, he said, discoveries already made, for instance in interpreting speech, "will lead to big advances" in the future. Go deeper: In January, Gary Marcus, a New York University professor, ignited a firestorm in the field with a paper that catalogued doubts about machine learning, the most broadly practiced method of AI. Among the leading lights to deride him was Facebook's Yann LeCun. Some leading AI researchers continue the hunt for super-human intelligence. Among them is Judea Pearl, winner of the Turing Award, the highest prize in computer science, and author of The Book of Why, in which he proposes a new map to intelligent machines. Pearl calls his approach "causal reasoning," the ability to infer the whys and hows of a situation. While it won't itself get to artificial general intelligence, causal reasoning is the route there, and thus will mark a "mini-revolution," he tells Axios. The problem with machine learning, Pearl said, is that it rests on correlation and association, which have made remarkable achievements but are still elementary in terms of true thinking — they can take the field only so far. He told me the story of an AI program watching a rooster crow day after day before the sun rises, and determining that it causes the sun to rise. That is an example of correlation. But, Pearl writes in the book, "Causal explanations, not dry facts, make up the bulk of our knowledge, and should be the cornerstone of machine intelligence." The goal of AI researchers "is to produce machines with humanlike intelligence, able to converse with and guide humans. Deep learning has instead given us machines with truly impressive abilities but no intelligence." Meanwhile, causal reason differs by reasoning out a situation without specific training, said Pearl, and borrows from methods already in use by social and health science researchers. For instance, a self-driving car equipped with causal reasoning could encounter a situation for which it has no data, and instantly adapt, said Pearl. Go deeper: In this Bloomberg video, Facebook's Yann Lecun discusses how to advance AI. Why it matters: Society apportions much effort to identifying geniuses of almost every type — athletes, intellects, musicians. An exception is "super builders," Clifton says, by which he means the few responsible for our biggest practical companies. "There may be 400,000 Steve Jobses, but we don't have ay idea who they are. But imagine if they were point guards. We would be all over them." What's happening: Clifton, author of a new book called "Born to Build," tells Axios that Gallup has developed a test to do precisely that — one that "identifies alpha males and females." He calls it a "Builders Assessment." Recently, Clifton administered the test to students at the University of the District of Columbia. Ten passed. He hired all for paid internships this summer. "Our tests pick up those with high IQs, but not this one kid," the builder, he said. "We think that 2% to 10% have those characteristics. If we could test all the high school graduates, we could get just them. We could treat them like halfbacks." Silicon Valley and its copycats are ecosystems for innovation. But Clifton differentiates builders. "Innovation is what they do at DARPA," the Pentagon's radical invention lab," he said. 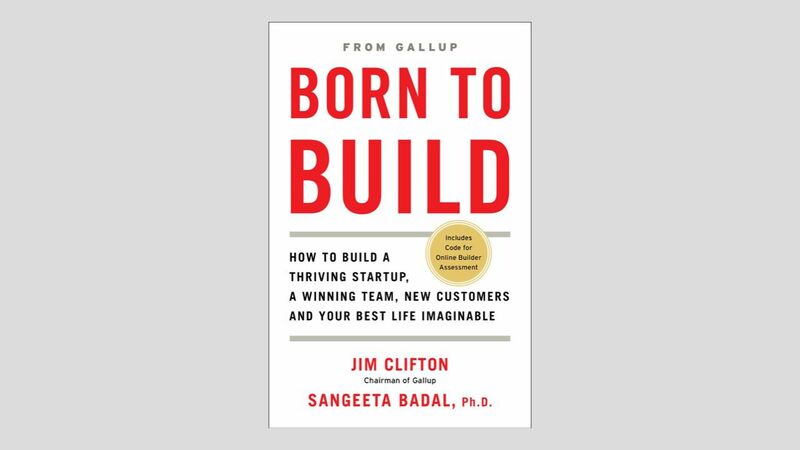 "Builders are the Bill Gates and IBMs that built everything up."